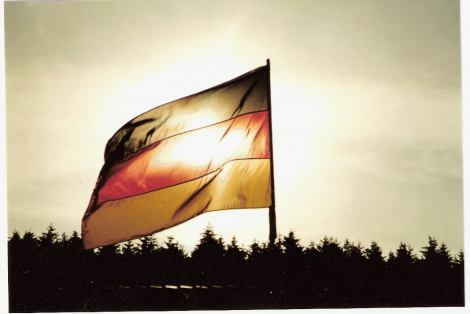 Germany is through to the Quarterfinals at the 2010 World Cup. And knocked out England in the process. As a German national, I don't really see the problem all my British neighbours have with this outcome of last Saturday's match. I myself was rather jubilant. What can I say? While the Lions were only roaring, the Eagle was soaring. I did miss something though: Fußball-Fieber, as I'm used to from home. Watching from massive Public Viewing spaces instead of tiny pubs or confined to the four walls of the living room. Celebrating victories by driving your car through town, honking, waving flags and joining convoys. Flags of all participating nations proudly displayed in windows, shopfronts and flapping around cars. Nobody getting bullied for supporting "the wrong team". 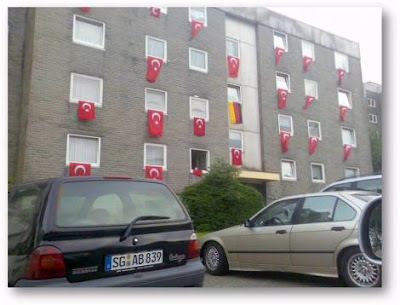 I remember the Euro 2008, when Germany played against Turkey and ultimately won. Fears were high there might be trouble in the streets of my hometown of Solingen after the match. 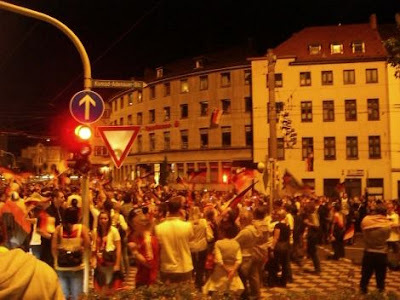 Instead, Turkish and German fans flogged to the city centre, closed the main thoroughfare in the process and celebrated out on the street until the early hours. I'm no football expert but even I was feeling worried when our lads went out on the pitch for our World Cup showdown. Not because I was afraid England might lose - that'd never happen, obviously - but because Germany might win, and I was sitting next to a German supporter in a pub packed with England fans. I was thinking I'd be lucky to survive the first half as my other half, Cornelia Kaufmann, hails from the city of Solingen, in northern Germany, and wasn't going to let living in Britain get in the way of supporting her country's sports stars. I knew the high stakes for both teams. I just wished it wasn't such a crucial match for Capello's crusaders, who'd made it through to the knockout stages by the skin of their teeth. Aware of the imminent dangers of causing a diplomatic faux pas, we deliberately chose to view the match where the England support might be a little more muted - Wales. I reckon it was probably one of the best decisions I've made, because while there were plenty of England supporters to cheer BOTH the England goals, there were also plenty of ABE - Anyone But England - fans cheering alongside Conny. They didn't want Germany to win either, but they definitely wanted England to lose. It's the most unlikely cultural partnership I've ever seen, but I was glad the lone German wasn't the only one cheering for the other side. As a proud Brit, despite the sunshine last Sunday, it was a dark day. I'm not going to get into what went wrong but the score speaks for itself, and I can't think of any worse consolation than a jubilant German. She actually wanted the score to be 5-1, just to rub out memories of nine years ago when England fans were celebrating that score. Following the World Cup in the UK and not supporting England might not be the smartest idea. Don’t get me wrong – I’ve lived in England for the last three years and I love it here – but when it comes to football, I’m cheering for my own national team. Yep, you’ve guessed it: I’m German. Sitting in a Welsh pub surrounded by England supporters felt weird. Previously, I’d followed matches from Public Viewing spaces but this time I was the odd one out. I tried to keep my enthusiasm down for fear it might get me into trouble, but it did prove rather difficult to keep quiet.I found myself muttering tactical suggestions in German and couldn’t suppress a “Yes” when the whole pub went “NO!” All the while, my England-supporting other half shook his head disapprovingly. Hand on heart though: you would probably have cheered too if it had been the other way round. What I missed in England were multicultural celebrations, flags of all the participating nations being proudly displayed and rival supporters celebrating side by side. With this being a match between arch rivals England and Germany I knew it would be different, but I didn’t expect it to go that quiet. The whole nation went into mourning upon that final whistle and I felt sorry that England’s second goal didn’t count. Driving through town after the match, I only blew my tiny, electronic vuvuzela once to celebrate. The noise it made was so quiet I doubt anyone actually heard it. It's 8.30am and I'm sitting in Starbucks on Liverpool's Castle Street. For once I'm early and have time to sit and observe instead of downing my coffee while walking to work. The coffee shop itself is not as busy as I thought it would be, but I also know that could change in a second. More than once did I walk away without something caffeine-containing because the queue was that long. A man in suit and tie works on his laptop on the table across from mine. Another man sips coffee in the corner, while lounging on one of the sofas and reading today's news. Business men, construction workers and women in summer-y, flowery dresses walk past, and I can see them thinking "coffee would be nice right now" while they haste out of sight. One of my colleagues just walked through the door. It seems I'm not the only one who needs to wake up! 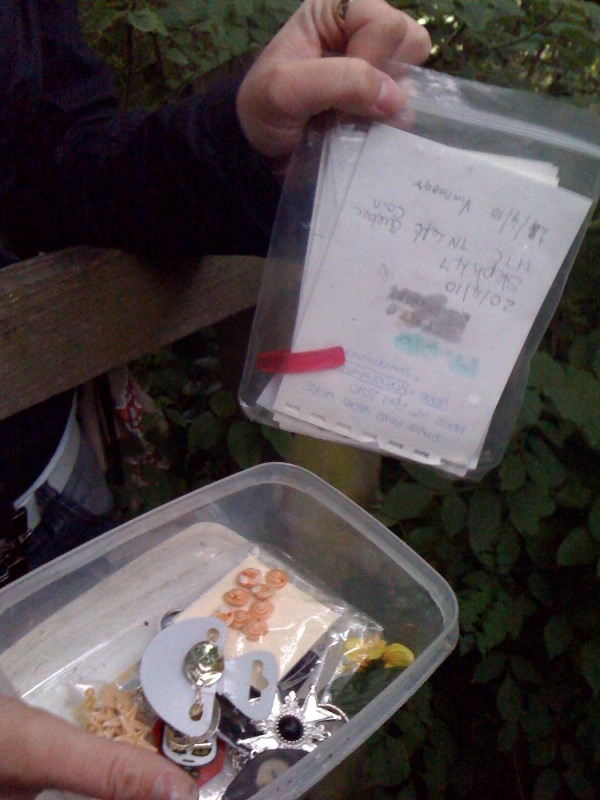 I've finally had the chance to do something I haven't really taken part in since I was in primary school - I went on a treasure-hunt! Katie and Sian have been treasure-hunting since the start of the year. They know that treasures are hidden all over the world, but focus mainly on Southport and surroundings for now. Together with them, I set out to find trinkets and sign my name on the list of those who have found it. It's a nice game, suitable for anyone, and just as exciting as your childhood memories suggest. Somewhere out there, little boxes are hidden and buried, and it is your task to find them, using their GPS coordinates. You don't take anything though. You add to the collection of treasures with little things (some teams and individuals have their trinket of choice they always leave behind), or, if you do take something, you replace it with something of equal value. We found a bracelet, cigarettes, a lighter and much more. This time, because we were unprepared, we didn't leave anything ourselves. We just signed the list to say that we found it, stated date, time and "thanked them for the cash" and hid it again just where we found it, for others to find it in days to come. These treasures are not hidden in plain sight, and you will have to search for them quite a bit, turn over rocks and look in and under trees. It's fun, gets you out into nature and you can either do it as a one-off while out on a picnic or daytrip, or be serious and try to find them all. I have definitely found a new hobby - and I only had to walk 300ft to find my first treasure! Katie and Sian are right: you do get hooked on it! 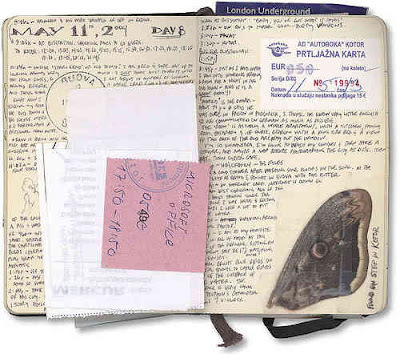 When I was on my Gap Year from September 2006 until July 2007, I kept a travel journal. Partly because I wanted to keep track of what I was doing, partly because I wanted to remember everything and to a great extend because I wanted to record what struck me about the places I visited. While I was travelling, I kept an online journal as well, to keep family and friends up to date. Unfortunately, I lost one of my travel journals due to sending it home and the parcel never reaching its intended destination. However, the online blog, most of my notes, flyers and of course all my other journals are still there, and now I think I should put the skills I learned on my BA Travel Journalism to good use. I am planning to turn my journal, along with maps, loads of photos and anecdotes into a book! Thanks to QuarkXpress, Adobe and issuu.com that should not be a problem, and it would be instantly available for everybody who is interested in it. Oh, and yes, I'd write it in English this time 'round. What do you think? Good idea? Bad idea? Let me know!